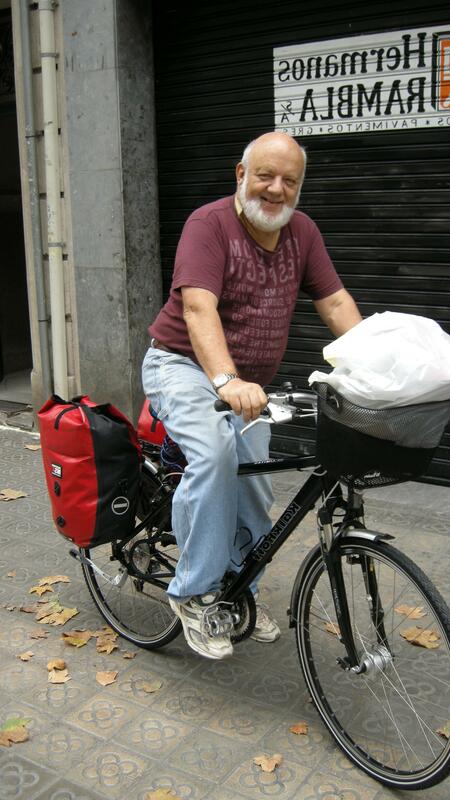 Here is my first email on my bike travels in Spain. You will remember that I have only been traveling for two days so things will get better. (Come and join me whenever you like) I started the trip on Sunday afternoon by getting the train to Reus so that I could set off early on Sunday morning from Edo´s parents farm. When we arrived at the station Edo´s father had very kindly drawn up a map showing me the route to follow to the farm. Easy enough. Except that if your drive a car you see the world through different eyes to a cyclist. The first part through the town was perfect but after that I got lost on a network of unmarked internal farm roads that seemed to go on for ever. Eventually a very kind man spoke to Edo´s Dad and agreed where I was and the place I should go to be met. There are other things to mention but let me do it in note form. I have two overfilled pannier bags on the back of the bike. Perhaps 30 kilos+. This changes the way the bike handles and bang over I went. I became dehydrated. This was a new experience. When I finally arrived at the farm I was unable to concentrate or talk. I just had to drink. Also my energy levels dropped way down. Edo´s Mother had a super dinner party arranged and that brought my energy level up again but I still got up four times during the night as I still needed to drink!!! In the morning I left at about 10.00am. It was cool and overcast so there were no problems. I wore the same jeans I had had on the day previously. Ouch. I did not get to the end of the farm road before I stopped and changed into my special padded cyclist shorts as even on the first day I had a severe case of `bike bottom´. Without too many problems I found my way to the coast and immediately drank a litre of water so I would be ready for the day. My first error was to follow the ´bike path´ that ran along by the beach as this really take the longest possible route. Once again I toppled off my bike. Not sure why but by now a number of ridding difficulties had made themselves known. The bike has a tendency to pull to the right although this may be because it is not correctly balanced. I find I have to use a ´mounting block´ as there is no way I am able to swing my leg over the top of the panniers. (when I am able to send some photos you will see the reason for this). Also the tip of my saddle constantly gets caught in the back of my cycling shorts so that at times my bottom smiles back at those behind. I am still not use to the gears but that will come with time and yes my legs do hurt. With all these problems I am not letting them upset me. Time will solve them. I have found that it is essential to stay out of the sun from 11 to 4. The first day I found a huge olive tree and slept on my new (wonderful) self inflating mattress. Today I was not so lucky so spent an hour in a bath of ice cold water.One other problem I have to solve is what and when to eat. Yesterday I had coffee and bread for breakfast and did not eat again until after five when I ate a large packet of honey roasted peanuts and small bottle of chocolate milk. Since I am trying to control my Diabetes 2 my idea was to avoid all carbohydrates which I still think is a good idea. However at times I feel weak from lack of food. Eventually I will sort this out too. Virtually no planning went into this trip. I do not have sufficient time to do it all on the bike as I have to return to Venezuela. Eventually the pains in my legs will stop and I will learn to push the bike without the peddles trying to cut my feet off at the ankles. So that is it. The first two days. It will get better. This entry was posted in Life on a bike, Uncategorized. Bookmark the permalink.